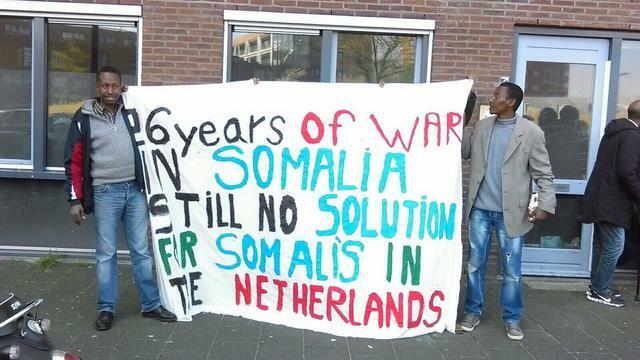 Yesterday, the Somali group of We Are Here won the court case against the State of the Netherlands with regard to their stay at Florijn 8-11 in Amsterdam-Zuidoost. The authorities ordered the immediate eviction of the ‘Vluchtlumumba’, which they started to inhabit on 9 April 2017. However, their request to stay until the end of the Ramadan has been granted by the Court of Amsterdam. The group consists of 20 men who have been in the Netherlands for a long time. Some of them have been here for up to 20 years, without the possibility to go back, or to lead a normal life in The Netherlands. After being evicted from a previous building last year, they were on the street for four months. As many of them have various health problems and as they needed more time to find another place, the group decided not to leave the building as ordered, but demanded to be allowed to stay until 3 July. From 3 July the group will again be on the street however, while the night shelter of the municipality, the BBB (bed, bath, bread), is still full. Besides, it is not a solution, as leaves people on the street during the day. “We still call on everybody to change our problematic situation. We need a status for our basic human rights and a place to live on the long term”, according to the group. Since the start of We Are Here, more than 80 of its members have been granted official refugee status.